Are you a coffee addict who doesn’t know a thing about tea? Maybe you’re a tea enthusiast and don’t know much about what you’re drinking. No matter your expertise, everyone can learn a little something about tea from our handy FAQ-style guide. All teas come from the leaves of the camellia sinesis plant. Technically, herbal teas are therefore not actually “teas” unless they are infused with camellia sinesis. Black, green, white and oolong teas are made from the camellia sinesis plant. Chamomile, mint and hibiscus “teas” are herbal and are technically not teas (but we will count them as such to keep things simple). Earl grey tea, however, is black tea infused with the herb bergamot, so it is in fact a tea. All teas come from the camelia sinsesis plant, so the thing that differentiates green tea from white tea, for example, is how long the leaves have been oxidized, or exposed to air. White tea and black tea are on the opposite end of the oxidization spectrum. White tea is not oxidized and black tea is fully oxidized. Green tea and oolong tea are in the middle, with green tea being oxidized more than white tea, but less than oolong tea. The more oxidization, the stronger the flavor of the tea. Tea can give you an energy boost without making you jittery like coffee, and unless you’re drinking black coffee, tea will probably save you some calories too.The following chart shows the amount of caffeine found in an 12 oz cup of the beverages below. Most of the time, if the tea has a color in its name, it’s caffeinated. For example, green tea, black tea, white tea and earl grey are caffeinated, whereas chamomile, mint and hibiscus teas are herbal and usually aren’t caffeinated. One exception is oolong tea, which is caffeinated. Each tea has its own special powers. Black tea contains the most caffeine, so it’s a good way to start the day. It is high in antioxidants that target bacteria in your mouth and keep it clean. It also supposed to help lower your cholesterol. 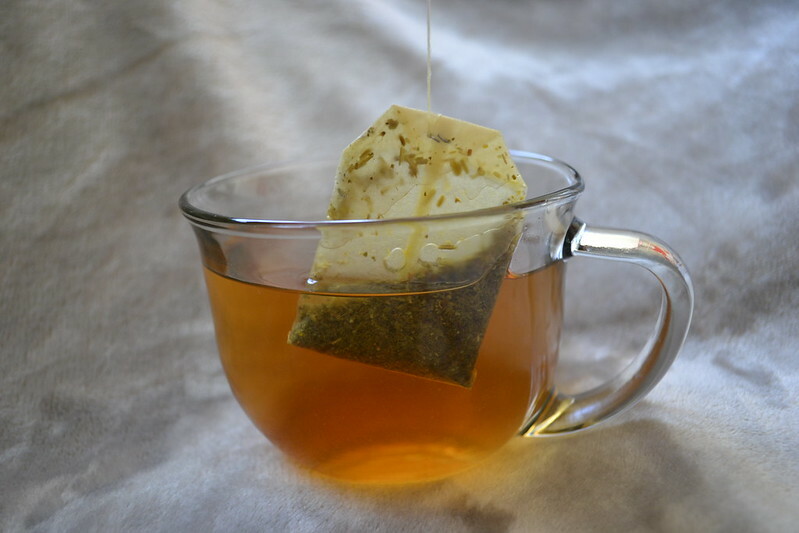 Herbal teas contain no caffeine, so they’re great for relaxing. It’s also used as a holistic medicine. Growing up, my grandma would always give me chamomile tea when I had a stomach bug because it helps soothes the stomach. Mint tea is perfect for relaxing because of its flavor. 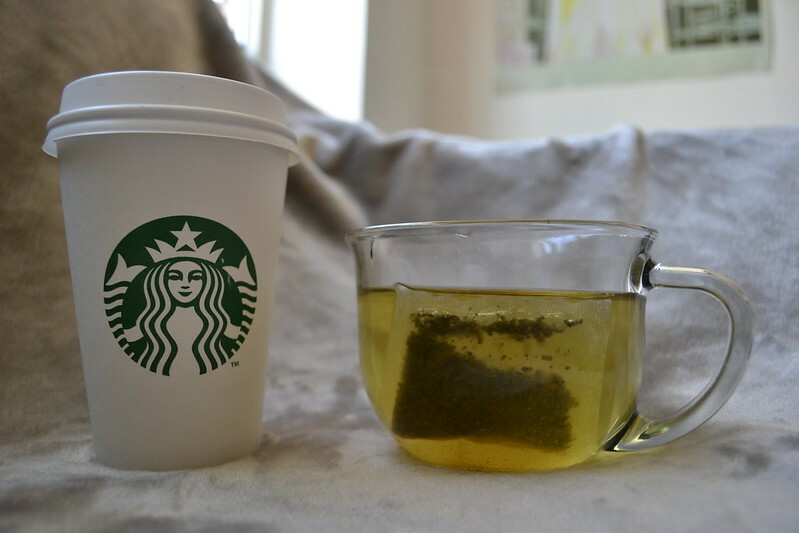 Green tea has the most antioxidants of any other tea. Green tea’s antioxidants specifically help ward off heart disease and cancers. White tea also has antioxidants that prevent cancer, promote weight loss and prevent wrinkles. Make tea a part of your daily routine to get the best of its health benefits. Loose leaf vs. tea bags: what’s the difference? Loose leaf teas tend to be more expensive, but are generally higher quality. They are sold in bulk, usually at specialty tea stores, and come in full leaf form, rather than crushed up into pieces like in tea bags. Loose leaf teas tend to be fresher and stronger in flavor. Specialty tea shops also tend to have a greater variety of unique loose leaf tea flavors than you can find bagged in your grocery store. To prepare loose leaf tea, you need either a mesh ball that you put the tea into and then let steep in your cup, or a tea pot with a built in strainer. 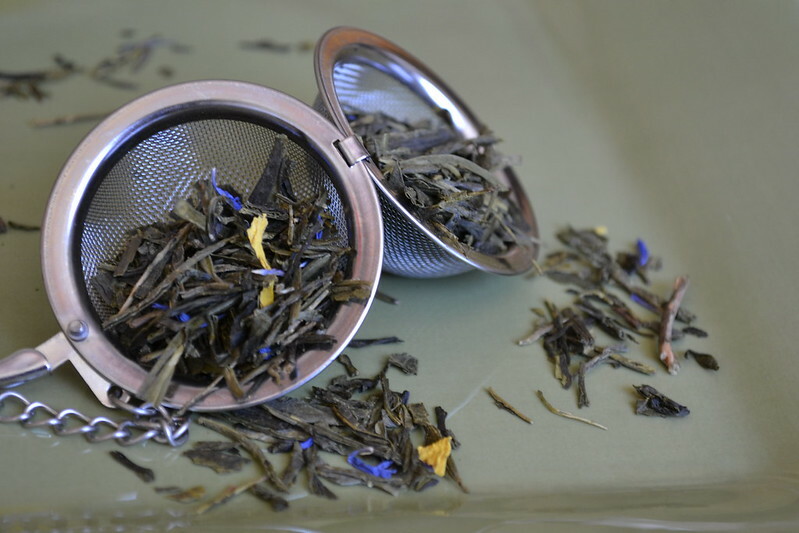 Loose leaf teas also need to be stored in an airtight container so they don’t become stale. Bagged teas are all about convenience. You can find them at any grocery store and depending on the brand, they tend to be cheaper than loose leaf tea. Unlike loose leaf tea which you have to measure out each time you want a cup, each tea bag is perfectly portioned for one serving of tea. Tea bags lose quality to their convenience. They tend to be less flavorful than loose leaf teas because they aren’t as fresh. In the end, tea is a matter of preference. Unless you’re a tea connoisseur, you probably won’t notice a big difference between the flavor of loose leaf tea and tea bags. However, if you buy a mesh tea ball at a tea shop, you’re equipped to prepare any loose leaf tea you decide to buy in the future. It’s all up to you. How do I make the perfect cup of tea? There are many ways to prepare a cup, or pot, of tea. The method you choose will depend on how much time you have and what supplies you have. The traditional way of heating water is using a tea kettle, which starts to whistle when it’s ready because of the pressure built up from the steam. Kettles tend to be best if you’re preparing multiple cups of tea because they hold more water. 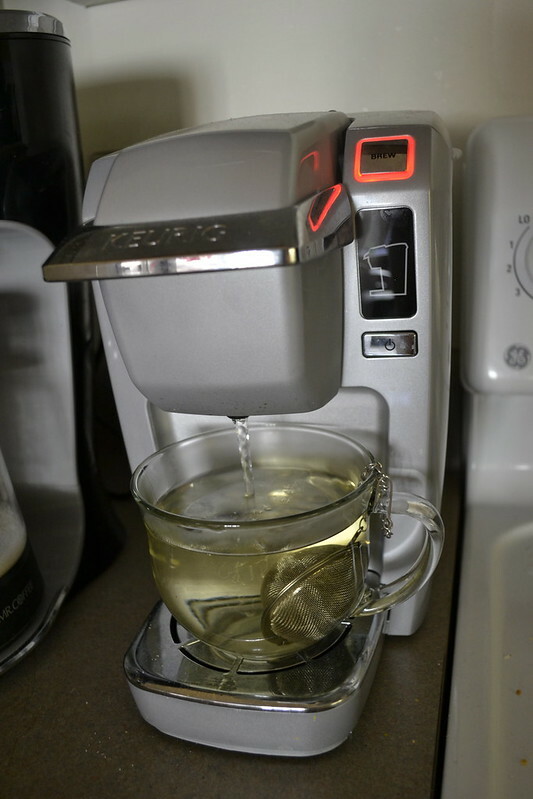 If you don’t have a tea kettle, you can microwave a mug of water or just use your Keurig without a K-cup inserted to boil water. These methods are most convenient if you’re making one serving of tea. Steeping is leaving the tea in the water to let it diffuse its flavor. Each type of tea has an ideal steeping temperature and time. You can follow this chart or follow the directions on your box of tea. Brewing teas at the recommended times and temperatures will ensure that you’re consuming the beverage the way it was meant to taste. To follow the steeping chart, you will need a food thermometer to check the water temperature and a timer to tell you when it’s ready for consumption. Or, you can avoid all the fuss and just leave your tea bag/mesh ball in the water as long as you want and remove it if the tea’s flavor becomes too strong for you. Sweetening: How you sweeten your tea is a matter of preference. Honey goes well with herbal teas. Sugar is another classic, but be wary of overloading your tea with it, otherwise you’ll be drinking your calories. However, sugars and sweeteners tend to take away from tea’s natural flavors. To get the best of tea, try drinking it without sweeteners, or slowly weaning yourself off of them.